I can't wait to read Jessica's stories. And now, thanks to you, Heather, and you, Laurie, for a great interview, I've added Azure to my authors-I-must-read list. I've already read most everything Dawn's written, and I can't agree with you more what a sweetheart and fantastic writer she is. Thank you for telling us about Decadent's sci-fi line. It's awesome SFR is becoming more and more popular as a cool genre to read and write in. Great interview, Heather. I can't tell you how excited I am to be part of this launch. 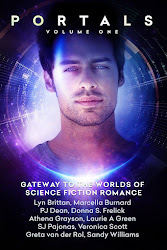 I love sci fi rom and it's great to be a part of the community. Congrats on the new line and thanks for the SFR support! Will be checking out the World Bible and books. I wrote in a multi author paranormal series (Del Fanatsma) and it was a blast. Great interview, Laurie and Heather. I know and like all these authors but I've been with Dawn right from the start. She's fantastic. Her imagination knows no bounds and I always know I'll love what she writes. What a great sandbox to play in! Thanks for xeploding the myth that women don't read SF.